The 2011 was the year to become the best Web Browser and the war was between the Microsoft's Internet Explorer, Google's Chrome, Mozilla's Firefox, Apple's Safari and Opera. 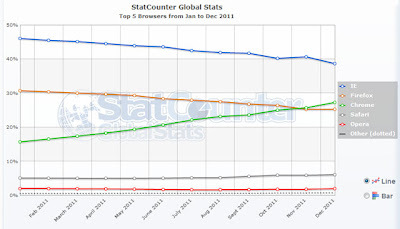 According the statistics from StatCounter Global Stats report of Top 5 Best Browsers from Jan 2011 to Dec 2011, the Internet Explorer is still dominating the web browser war and has becomes the world's most use and popular browser of the year 2011, after IE Google's Chrome is leading the chart but with third spot and has beat the Mozilla’s Firefox market share in 2011, which is now holding the second place. Microsoft's Internet Explorer currently holding 39% market share, Google's Chrome is at 27%, while Mozilla's Firefox holds 25% of the market. 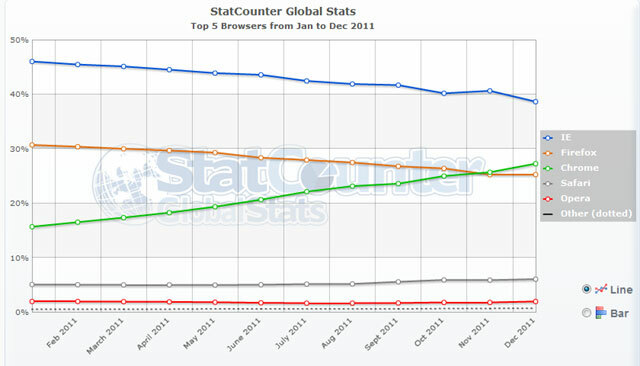 Apple's Safari and Opera are with 6% and 2% market share, respectively. 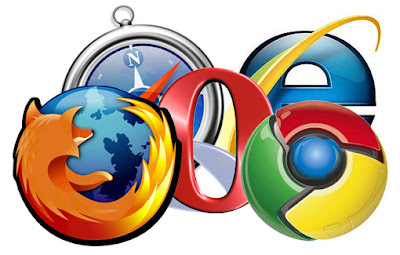 Take a look at following Statistics Chart to know more futuristic statistics of the War between IE, Chrome and Firefox in 2012. Who you think can hold the top spot rank in 2012 and leads the other web browsers? And become the world's best and popular Web Browser of 2012?